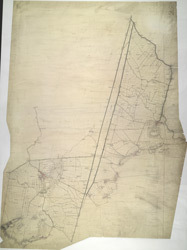 This drawing covers part of the Cambridgeshire fenland, an area characterised by straight, water-filled dykes dividing arable land. The New Bedford River is shown running down the middle of the sheet, almost parallel to the original Old Bedford River, taking the waters of the Great Ouse to Denver Sluice, at top right of the plan. In the 17th century, the Dutch engineer, Cornelius Vermuyden was appointed by James I to direct the drainage of the wetlands. As a result of Vermuyden's work, the fens took on a very different appearance, changing from an area of flooded marshes to one of extensively farmed agricultural land.